Monitor Backlinks is a backlink checker tool with some unique workflows and tools. It's a tool with a lot of potential for marketing and growth. I'll show you how to use it for backlink building, rank tracking, and for spying on competitors. My first impressions of the tool's interface were that it was a little clunky. I prefer very clean lines, consistent sizing, and smaller text. It’s an aesthetic thing that might not be an issue for many people but if you're going to spend any time in an app it's always preferable that the app has a nice interface. Despite my qualms with the fonts and colors I like the uncluttered layout and navigation of the site. 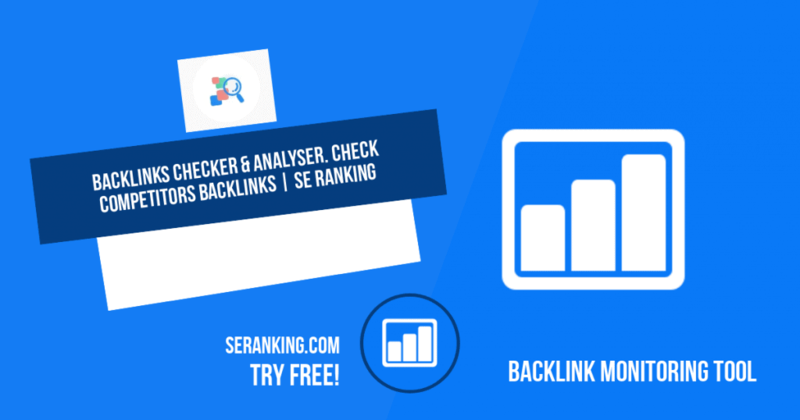 Monitor Backlinks is an awesome backlink checker and a good keyword tool. For more robust SEO tools that offer Keyword Tracking, Keyword analysis, backlink management, PPC ad tracking, and content auditing, try SEMrush or SE Ranking. The Startup Plan costs $21 (paid annually) per month for one domain. With this plan you can monitor two competitors. The Freelancer plan offers 2 domains and 4 competitors/domain and is priced at $40 a month (again, paid annually). The Agency plan is $120 and has 7 monitored domains with 4 competitors per domain. There's also a free backlink checking tool. 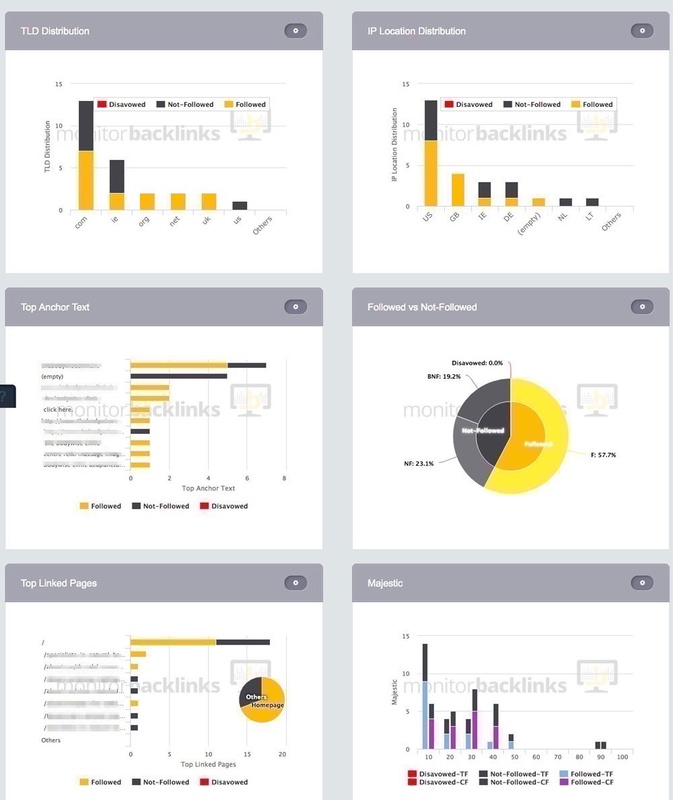 The tool checks backlinks data from a number of sources including Moz and Majestic. It then strips out the noise and potentially misleading backlink information to provide a cleaner and more intuitive backlink list. The first feature I will mention is the Average keyword position indicator on the overview page, just below the graph. The font is huge, and colored orange, so it stands out but this figure allows you to see if your keyword positions are improving or dropping in rank. Beside this indicator are the New Backlinks and Organic Traffic from SE indicators. The New Backlinks section also displays the number of backlinks that have no SEO value (noFollow links, in particular). Three icons in circles at the top left of the screen provide information about your account when you hover over them. The first is the Domains icon and shows how many domains you have on your plan and how many you are currently tracking. 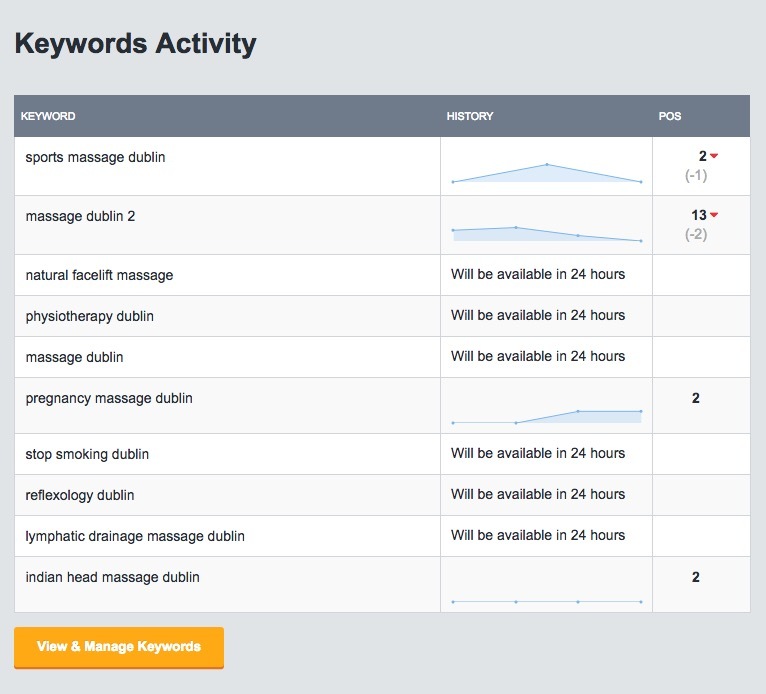 The second is a keyword indicator and shows how many keywords you are tracking and the total you are allowed. The third is for links. 5000 is the limit for all domains (out of 4 total) on the premium account and this might not seem like a lot but Monitor Backlinks does not include multiple links from each domain in this so it should be sufficient for 4 small to medium sized websites. There are seven tabs at the top of the screen which work as a type of navigation bar for handy access to all the tools. These tabs provide quick access to the following pages. An Overview of the account showing a progress graph, the top keyword activity changes, new added links, last competitor links, and link status changes. Once I got used to the layout I found it a well-designed way to quickly see the current status of my websites. The Backlinks page is where the real action happens. Reports where you can view reports about the types of domains linking to your site, the follow to no-follow ratio, top linked pages, most shared backlinks, and more. The competitors page where you can view the backlinks of up to 4 of your competitors. This is very useful for backlink acquisition. The Keywords page where the rankings of your keywords are displayed in a graph and the position changes of each are also displayed. 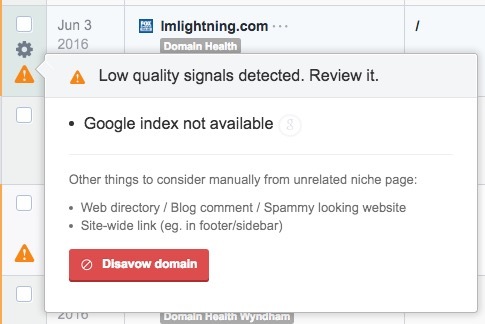 The Disavow page where you can set up rules for disavowing spam related links. The History page, where you can see the history of your link profile. Very useful for uncovering old links that were once contributing factors to your ranking. Along the top of the overview page there are 11 indicator icons which show various key statistics about your site. The first shows the number of social media shares that the homepage has. The software points out that this doesn’t directly affect SEO. It’s more of a vanity metric and an indicator of popularity. The Alexa rank is based on worldwide popularity and not country specific popularity. The Moz Rank takes it’s number from Moz.com and is based on the quality and quantity of links. Scale of 1 to 10. D. Authority refers to the domain’s authority and reflects how well a site will do in a search engine’s rankings. Scale of 1 to 100. Backlinks shows the total number of backlinks based on a single link from each referring domain. Unique Domains refers to the number of domains providing links to your site. This is updated every day. Speed is an indicator an important SEO factor, your site’s loading time. If you hover over the number on the toolbar some quick on improving the speed of your site will appear. A button on this menu brings you straight to Google Pagespeed Insights for your website. The speed indicator appears to refer to the mobile speed as opposed to the desktop speed. The next indicator is a Spam Flags number. Based on a scale of 0 to 17 it shows if your site is displaying the characteristics of a SPAM site, such as large amounts of Follow links. Trust Flow (TF), the next indicator is a metric from Majestic SEO which shows the quality of the sites that link to your website. High TF means a high-quality site. This is worth investigating if you are trying to improve the quality of backlinks. Backlink management involves finding quality backlinks and reaching out to site owners in an attempt to create relationships. Understanding which backlinks are worth pursuing and which are attainable is valuable information. This information is presented quite well here. Citation Flow (CF) refers to your site's influence. It’s an indicator of power and your site’s authority. The final indicator pulls its information from Google’s ‘transparency report'. If it displays anything other than OK then you should investigate further. Below the toolbar is a graph which provides a visual representation of the progress of your sites backlink and keyword status. Together the ‘new backlinks’ value, ‘organic traffic’ and ‘average keyword position’ can help determine how much the new backlinks influenced traffic and keyword positions. If a site does not have a lot of new inbound links on a daily basis this can be very hard to see (as in the example above) but each display can be added or removed and it’s a great tool for visualising your progress. Below the graph you'll find 4 tables which show the latest keyword activity, added links, competitor links, and the links status changes. Clicking on the yellow button below each brings you to a new page where you can examine all the data relating to the table. 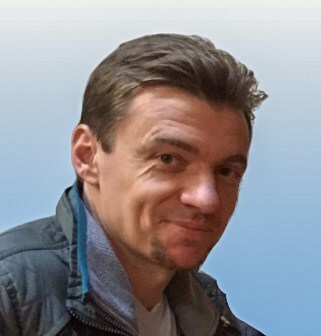 Backlinks are presented in the order they were acquired. The diagram below shows the main displays and indicators for each backlink checked and the referring domains detail. There’s a ton of information here and you can get quite deep in your analysis of each backlink. Some of the tasks you can perform on each backlink are explained later. On the leftmost column you might see an orange triangle on some of the backlink entries. This signals that the link is showing signs of being of low-quality. Click on the triangle to uncover more information about the possible causes. This indicator will help you decide, along with other factors, whether to disavow the link or keep it. This page provides charts on every aspect of the backlinks your site has. TLD distribution, Anchor Text, Followed v Non-Followed, and Top Linked pages are some of the best reports to check. You can export each report to CSV file for filtering. You can also filter the reports based on many different factors such as Not Indexed links, Moz Rank above a certain level, high external links, TLD, Moz Spam score, and more. The reports change instantly with each filter. It’s a very useful feature. The number of competitors you can add depends on your plan but the minimum is 2 per domain. Looking at our competitor backlinks is an excellent way of improving your own inbound links quality. 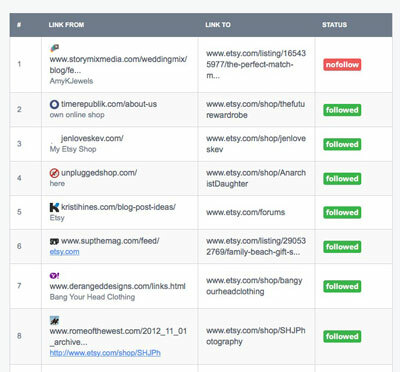 The link checker visits competitor websites automatically every week to see how you compare. The software sends an email alert if it finds new links. Extra information about the competitor domain such as Speed, Moz Rank, Spam Score, Trust Flow, and Citation Flow are also shown and this helps with understanding your sites position compared to the competitor. The status of the links, such as Nofollow, Follow, Server Down, Backlink Not Found, unable to crawl, 302 redirects, etc. are displayed per link. Monitor Backlinks also has a very good keyword discovery tool. On this page you can see visual representations in the form of graphs of your keywords as compared to your competitors, quick overviews of your keyword positions in the search results, and a table of all keywords that you have selected for monitoring with detailed statistics presented for each. What’s very useful about this page, as compared to other services is that keywords are displayed alongside competitor keyword rankings. This feature is not available in Ahrefs or SEMrush (my favourite). In the list of backlinks, you can also see how the keywords have changed in relation to each other. Total search volume, competition score, and cost-per-click scores are also shown (if available). All of the columns can be sorted and results can be exported to CSV or PDF to share with clients. 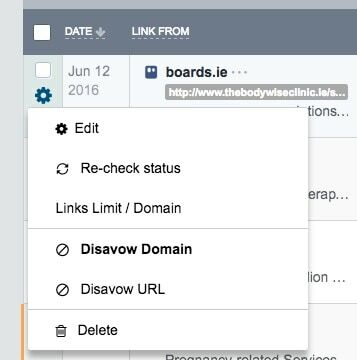 The disavow page is where you can manage rules that govern ‘removal of links' to your website. You would want to do this if a spam site is linking to your website or pages. Spam links are a negative indicator to Google and other search engines; the sooner you remove them the better for your site. For example, you can disavow links automatically that contain certain words, which may be unsuitable or spam-related. To disavow links you must use the selection tick box before each link on the Backlinks page, click the With Selected button at the top of the list, open the Disavow drop-down menu and select Domain or URL. It’s unlikely that you’d want to remove just URL, as bad links usually come from compromised or bad domains, so choose Domain to be sure. You will then see disavow tags added to the backlinks you just edited. Next, click ‘Filters’ at the top right of the backlinks list. Choose Disavowed, and click the empty box to then select ’Disavowed’. You can then export the backlinks tagged as disavowed. The exported file is created in the format the Google Search Console (formerly Google Webmaster Tools) understands and you can submit the file to Google for revision. That’s it. This page is useful for monitoring old backlinks that no longer work. They are checked every 5 days by Monitor Backlinks in case of status changes. It’s a good tool for research and for viewing what kind of status changes your links went through. The visual display of keyword progress. Graphs and images beat numbers any day. I find the layout a bit heavy on blank space without being super clean or neat but it’s definitely not cluttered and 8/10 on the readability scale. The side-by-side comparison of rankings is a great feature. Monitor Backlinks allows me to see keywords that rank in the top 100 and their competitor Ahrefs do not allow me to to do so, for a similar cost. SEMrush, however, beats both with a very impressive keyword feature. Keywords are not the main feature of the tool so I think they have done a good job here. The reports feature is pretty good and can be customised down to a very specific set of results. Another nice tool is the add tags feature. This will help you spot when backlinks have changed status (example follow to nofollow). The style of the site is not my favourite aspect, especially as many of MBs competitors have nicer interfaces. The Keywords Up, Keywords Down, 1st Page Rankings and Total Keywords features are a bit on the large side and really don't need to be. This might seem like a minor point but to truly get the maximum benefit from a tool you need to spend a long time working with it. Little things like this can be distracting. User experience is very important and the software with good UX wins the product race. Ahrefs.com, for example, has a very visually appealing interface and a slick design. This makes working in the app a pleasant experience. This is only a partial dislike. The company offers various levels of service and it can be customised but it might be an expensive tool for hobbyists or starting bloggers.